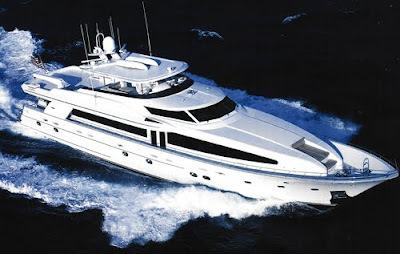 Looking for a great yacht with fantastic crew for your holiday charter? Look no further! M/Y OLGA offers 32' Intrepid, Scuba diving from the yacht for certified divers, zero speed stabilizers, VSAT 24/7 internet, multi lingual crew, the BEST service and CUISINE all for $59,000 wk ++ regular rate and $65,000 wk ++ for the Holiday. Available for Thanksgiving, Christmas and New Year free of delivery from Nassau. 121' MY with 5 staterooms - 10 guests: 8 adults in king, 2 queens and twin and 1 or 2 young children in over/under berths. All rooms with en suite head and shower. Great multi lingual crew including massage therapist offering the Best Service with a Smile! 5/6 international crew at the capable leadership of Captain Bernard Calot. Chief Stewardess is licensed massage therapist. Cordon Bleu chef. “Olga” features a formal dining area accommodating ten guests. Al fresco dining on the aft deck also offers seating for 10 and includes a full wet bar with refrigerator, ice maker, hand-held shower & access to the large swim platform. The fly bridge includes a large sun deck area with Jacuzzi and BBQ. An additional sun pad area is located on the foredeck. “Olga” comes fully equipped with electronics, audio/visual, surround sound system and complete communications package including 24/7 internet access. Olga's 2 stewardesses are both licensed masseuses, Chef Claire is Cordon Bleu trained and Captain Bernard, Mate Clem and deckhand Rafael can help you burn off those extra calories with a multitude of water activities! This well-equipped yacht is set up for fun on the water including snorkel and scuba equipment, dive compressor, kayaks, Hobie Wave catamaran, water ski’s, towable toys, fishing equipment and a 22’6” Novurania hard bottom inflatable with 150 hp Yamaha outboard. In addition there are 2 scooters. Powered by twin DD/MTU 16V2000 engines, she cruises at a comfortable 18 knots. Zero speed stabilizers ensure total comfort at anchor.